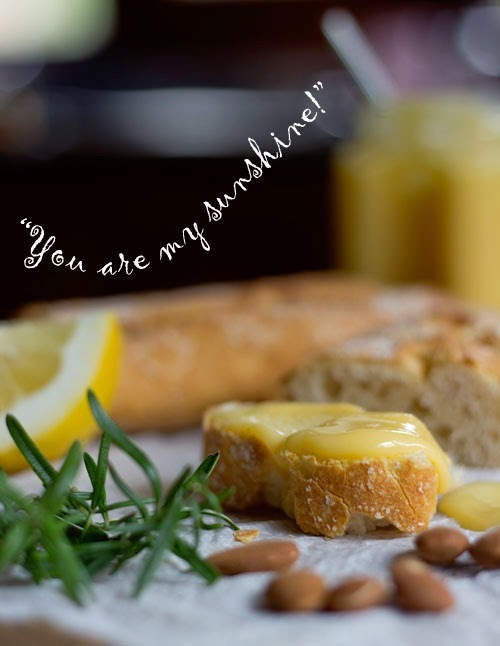 Alchemy in the Kitchen: Lemon, Rosemary and Almond Curd - Here comes the sun! 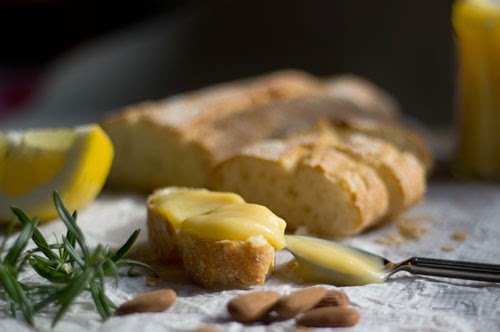 Lemon, Rosemary and Almond Curd - Here comes the sun! There’s nothing like a wet Sunday is there? It is such a contradiction in terms. Hey weather, pin back your ears. Sunday … SUN Day … geddit? Nope, obviously not listening. Well, I can’t go for my walk, I’ve finished my book; there’s nothing to my liking on the telly. A wet Sunday is a day for pottering; for tidying; for doing things that have been put on the long finger; for remembering things I’ve promised to do but never quite gotten around to doing. I’ve just remembered I promised my sister-in-law my lemon curd recipe – eeek more than two years ago! Now would be a good time to cough up the goods. Lemon curd is not difficult - it just needs about half an hour of your time and patience to magic a few simple ingredients into a puddle of liquid sunshine that you can turn into all sorts of deliciousness once it has cooled and set. Ok, you've captured a jar or two of sunshine. So now what? Well, I love it spooned into Greek yoghurt for breakfast; spread on toast; swirled through whipped cream and used to fill a meringue case, then topped with strawberries or blueberries or both, and applied to mouth. Swap it for jam... particularly in a Bakewell Tart – lemon and almond are best buddies. Use it to fill a sponge or to top a cheesecake. Make it now and you'll have it ready to take out of the fridge to spread on the crepes you’ve planned to make on Pancake Tuesday, just around the corner. Or simply pop a spoonful in your mouth at any time for an instant good mood. Put everything in a medium saucepan over a low heat. Stir gently and constantly for about 15-20 minutes or so until the mixture has thickened to the consistency of pourable custard. At no point should the mixture boil so don't be tempted to turn up the heat to hurry the process or you'll have lemony scrambled eggs. (You could also cook the mixture in a heatproof glass bowl over - but not touching - simmering water). Once the mixture has thickened, pass it through a sieve to remove the rosemary and the grated lemon zest. Pour into sterilized jars. It will thicken up further on cooling. Seal and refrigerate for up to a month. 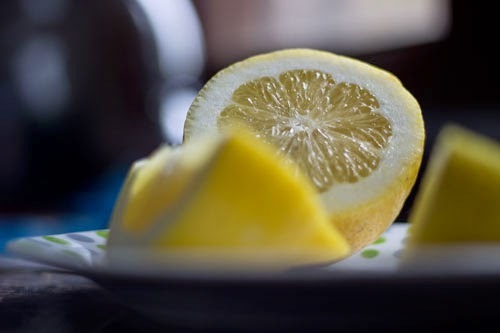 I am a huge fan of anything lemony! This looks so bright and beautiful..just the right one for the rainy SUNday! Just coming out of a horrid virus and bad head cold so when lemon and herbs are mentioned, I'm in. Even better when it looks and sounds delicious. Never thought of adding almonds to lemon curd, Hester. Beautiful! Must try this. 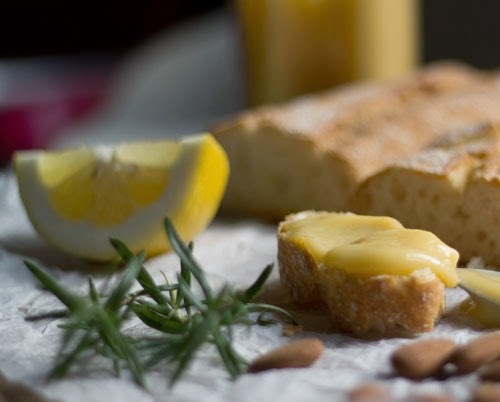 I love lemon curd and the idea of adding some rosemary makes it sound even extra wonderful! Now that is like having sunshine in your kitchen, even without the sun. So beautifully lemony creamy and great on so many things. The weather , in Hong Kong, if it makes you feel any better has been damp and hazy. I need to get some sunshine in my kitchen strait away so going to give your recipe a try asap. Dear Hester, your lovely lemon curd certainly looks like sunshine in a glass jar - who could not use a bit of that sunshine these days. I have always wanted to make some to eat with freshly baked scones - your recipe looks wonderful so I am going to look for some juicy lemons and trying out your recipe - the kids have not tasted lemon curd more than once, I am eager to have them taste it again - not only with scones but also with some shortbread coookies! Hope you are doing well dear friend! P.S. :How is your book doing?